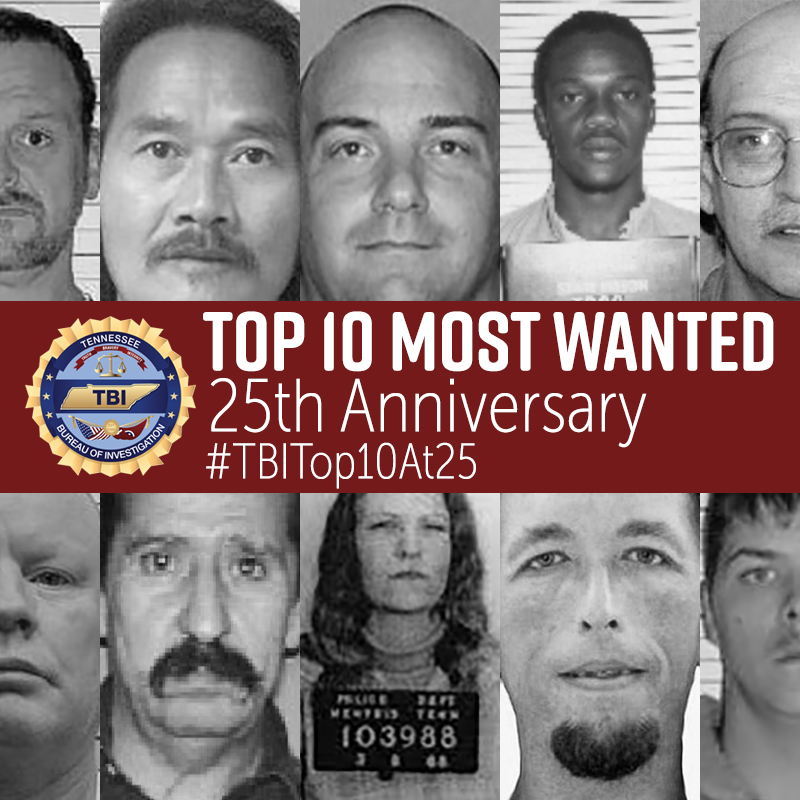 NASHVILLE – This weekend, the Tennessee Bureau of Investigation will mark the 25th anniversary of its successful ‘Top 10 Most Wanted’ program. Terry Lee Charlton: The first individual added to the Top 10 Most Wanted, Charlton was wanted to face multiple counts of Aggravated Burglary. He was arrested 18 months later, after a lengthy investigation led by Special Agent Mark Gwyn, who would later become the agency’s Director. Margo Freshwater: The first woman added to the TBI’s Top 10 Most Wanted (in May of 1993), Freshwater escaped the Tennessee Prison for Women in 1970, while serving a life sentence for murdering a store clerk in Memphis in 1969. She was captured in Columbus, Ohio in 2002. Adam Mayes: Added to the Top 10 in May 2012, Mayes was involved in the murder of a woman in Whiteville, along with the kidnapping of the woman’s two younger daughters. After a five-day search, a tip from the public led authorities to a heavily-wooded area in Mississippi, where Mayes took his life and the girls were rescued unharmed. Currently, only one of the original individuals added to the Top 10 in May 1993 – Robert Houston – remains on the list, and efforts to locate him remain ongoing. The public can access the full ‘Top 10 Most Wanted’ list on the TBI’s website: http://www.tn.gov/tbi.